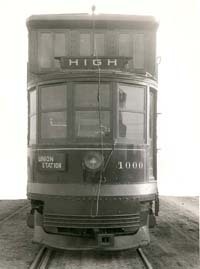 In 1914 the Electric Railway Journal published the following article on Columbus' new double-deck streetcar. Westward the trail of the modern "double-decker" takes its way. Pittsburgh and New York started the innovation, Washington followed suit, and now Columbus, Ohio, has one of the cars in operation along its principal business street. There are certain features about the Columbus car which commend it to the attention of those interested in the problem of providing the maximum capacity at a minimum operations outlay. The street railway situation in Columbus differs from that of any other city in the country in having only one street along which there is traffic congestion. Into the electric railway cars that traverse this street there crowd during the rush hours almost all the persons in Columbus who want to ride to or from their homes and places of business. During the morning and evening rush hours traffic congestion on High Street throws all the traction lines of the Columbus Railway, Power & Light Company off schedule, since ten out of the sixteen routes operated by the company converge on that thoroughfare through its busiest section - Broad Street to Long Street - a distance of only two blocks. In an effort to relieve this congestion, several years ago, the company got permission from the municipal authorities to re-route some of the lines so that they traversed the next parallel street east and west of congested High Street. The riding public, however, had become so accustomed to "taking the High street cars" that it refused to violate traditions and declined to patronize any other line. So the relief plan was abandoned. The situation which confronts the company has become more serious each year. Two-car train operation was recently tried , but this did not prove satisfactory because of delays due to long stops. Again, the operating expenses of the two-car plan were considered too large, since, with seating capacity of only eighty passengers, the train required a crew of from three to four men to operate it. The Columbus Railway, Power & Light Company, managed by E.W. Clark & Company, Philadelphia, operates under a franchise which demands next to the lowest unit fare charged by any company in the country. It is obliged to furnish eight tickets for a quarter with free transfers. It has become imperative, therefore, for the company to provide a car having the largest carrying capacity coupled with the greatest degree of efficiency. 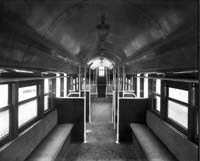 The low-level stepless double-deck car was decided upon as the type which most nearly comes up to the requirements. The reasons for choosing double-deck operation are contained in the following comparative table, which contrasts the operating expenses, initial cost and carrying capacity of the double-deck car with other types. The contrast with the single-ended combinations does not mean much as far as Columbus is concerned, since there are very few loops there. It is only when loops are numerous that this scheme of operation can be used economically, because without loops annoying delays result from switching movements at terminals. It will be noted also that the wages paid the conductor and motorman on the new double-deck car are the same as those of the single-motor car and represent a much smaller outlay than the sums paid to operators of the other types. The cost per passenger capacity per train mile is lower than that of the other contrasted types. Additional safety to passengers by elimination of dangers incident to entrance and exit. Greater convenience in entering and exit. Improvement in working conditions of motormen and conductors. Better sanitation through scientific ventilation. Elimination of dangers due to premature starting of cars, since they cannot start until the doors have been shut. Greater facilities for passengers who want to smoke. Traffic congestion reduced by increased of almost 100 per cent in carrying capacity per foot of street occupied. Decreased maintenance and operating expenses in the handling of passengers. The new car, built by the J.G. Brill Company, is 45 ft. 6 in. long over all, having an extreme width over the belt rails and eaves of 8 ft. 3 in. The trucks are on 29-ft. centers. The framing throughout is of rolled-steel or pressed-steel sections. Lower floor of car 1000. The lower-deck floor extends from the center of the car to the edge of the semicircular seats at each end, rising slightly from the center to clear the truck axles. The space underneath the end and cross seats is not floored and the wheels and truck frames extend up under these seats. This arrangement permits the truck to swing sufficiently to pass around a curve of a minimum radius of 37 ft. 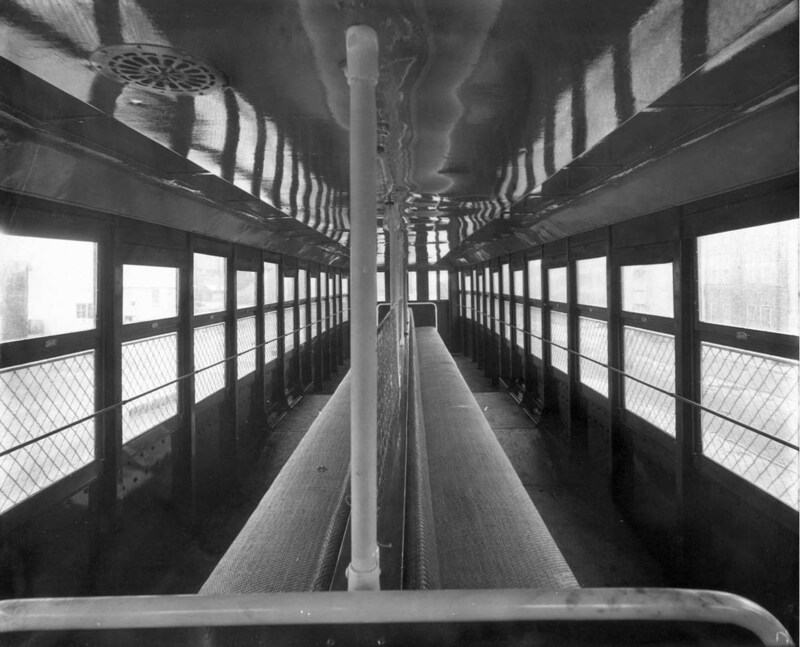 The upper deck extends only between the bulkheads which separate the motorman's cabs from the seating space of the lower deck. The stairways are at the extreme ends. Each stairway extends up with three steps to a platform and branches to the right and left with four more steps to reach the walkway of the upper deck. the stairways are provided with hand rails. Upper floor of car 1000. The walkway of the upper deck extends clear around the car except at the stair wells and is 5 ft. 1 1/2 in. above the floor at the semicircular end seats of the lower deck. The floor at this point is 19 in. above the rail and is reached by a ramp from the floor level at the entrance doors. The floor at the entrance is 11 in. above the rail. The upper walkway extends over the longitudinal seats of the lower deck, and it is not necessary, therefore, to have it high enough to permit a man to stand erect, it being only 6 ft. 8 1/2 in. above the track rails. 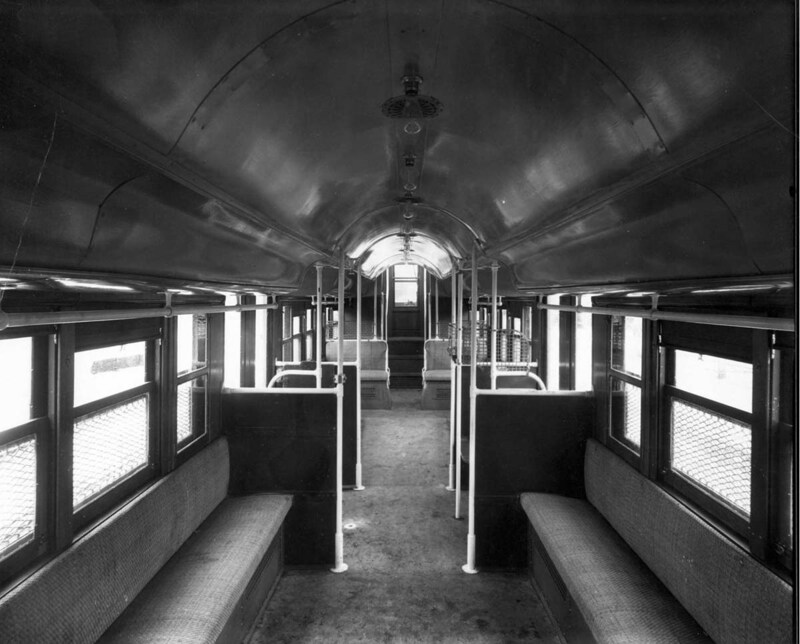 The seats on the upper deck are placed at the proper elevation to provide ample headroom along the center aisle of the lower deck, but are so high that it is necessary to provide a footboard along the full lengths of the seats, which, in giving space for passengers' feet, keeps them from blocking the walkway. The upper deck is closed [in,] in winter and will be opened during the summer months by taking out the removable sash and sections of sheathing. The ends of the upper deck are protected against the weather by extension of the first-floor bulkheads, and are fitted with outward-swinging windows. The upper-deck roof is of agasote covered with No. 6 cotton duck. The lower deck headlining is of agasote. Advertising card racks are provided for both decks. The floors of both decks are of ling-leaf yellow pine covered with 1/4-in. agasote. Carborundum safety treads are used at the center doorways and at the doorways of the motorman's cabs, and narrow sections of this tread are used to face the stairways steps and the front edge of the upper-deck foot seats. The car is equipped with Brill maximum traction trucks of the low-bolster type with outer bolster bearings outside of truck side frames. The axles are of Carnegie heat-treated steel and the wheels of Carnegie rolled-steel single-wear type. The driving wheels are 33 in. and the pony wheels of 18 in. diameter. The truck wheelbase is 5 ft. The brakes are the inside-hung type. Each truck is designed to receive one out-side-hung motor. Two GE-201-A motors are used with the manufacturer's grade L gears and grade K pinions. The gear ratio is 71:15. The motors are rated at 55 hp at 500 volts or 65 hp at 600 volts. The equipment is designed for a schedule speed of 8.5 m.p.h. with seven stops per mile, but the gear ratio will give a maximum speed of approximately 25 m.p.h. on level tangent track, all calculations were made on a total weight of the car, with eighty-eight seated and eighty-three standing passenger, of 69,085 lb. The control equipment is suitable for double-ended operation with K-36 controllers. The contactors are fitted with interlocks in connection with the control system in order to interlock the latter with the operation of the car doors. The motor rheostats are of special design in view of the low level of the car. GE straight air brake equipment is used. the C-P-27-A compressor has a piston displacement of 15 cu. ft. per minute when operated against a tank pressure of 90 lb. (gage) per sq. in. The equipment is provided with two brake cylinders, also five reservoirs of special dimensions, because of their location under stairways and longitudinal seats of the lower deck. The seats of both decks are longitudinal except for the semicircular seats and the two cross seats at each end of the lower deck. The seats on the upper deck are set back to back and the feet of the passengers seated on them are almost directly over the heads of the passengers who are seated on the longitudinal seats of the lower deck. The latter seats extend from the center entrance space to the end wells of the car. At the end of these seats are two permanent cross seats. The semicircular end seats extend from the cross seats around the end wells. All seats are rattan. On a basis of 17 in. 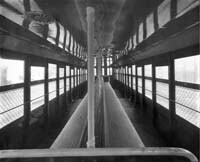 per passenger, the upper deck will seat forty-two passengers and the lower forty-one, making a total of eighty-three. It is expected that the car will take care of 171 seated and standing passengers. The total weight of the car completely equipped is approximately 46,000 lb., giving a weight per seated passenger of 554.2 lb. and a weight per passenger standing and seated of 269 lb. The only opportunity for entrance and exit is by the center side doors. These doors are made in halves. the total door width is 50 in. and is divided into two passages by a rail so that two streams of passengers may leave or enter the car at once. The doors are electro-pneumatically operated and are controlled by the conductor. The entire center of the car for a width of 50 in. is devoted to receiving and discharging passengers. The conductor is seated on a folding seat along the unused center door and before him is a swinging change desk. Space for ten passengers is provided on the loading platform. Entering passengers line up before this desk, and after depositing their fares in the fare box pass on toward the seats and stairways at both ends of the car. The door and step devices were supplied by the Prepayment Car Sales Company, New York, which also controls the Hadley-Doyle stepless car patents incorporated in this car. A forced-draft ventilator system is provided for the ventilation of both decks. The foul air is drawn through ventilators which are placed along the center line of the ceilings of both decks and is carried along longitudinal ducts to the motor-operated fan at the end of the car, where it is discharged. The duct for the lower deck is carried between the seat backs of the upper deck and at the center of the car a raiser connects this duct with the one running along the roof of the upper deck. Heat for the car is supplied by electric heaters, fourteen being installed in the lower deck and twelve in the upper deck.